Notes: Special Thanks to Mark for info on this. Recently came into possession of a couple of artifacts which imply this venue was open at least as late as 1960 and possibly later. I found an old trophy from a 1960 event held there at the swap meet in the k-zoo fairgrounds this past September. 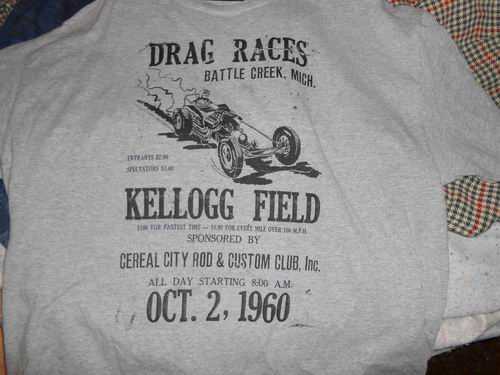 The trophy reads Cereal City Rod & Custom Drag Strip 1960. I also acquired a T-shirt which was made from an old poster at a swap meet in Gilmore's museum in August. The date on the shirt is Oct.
2, 1960 and I emailed a photo of this to this site. 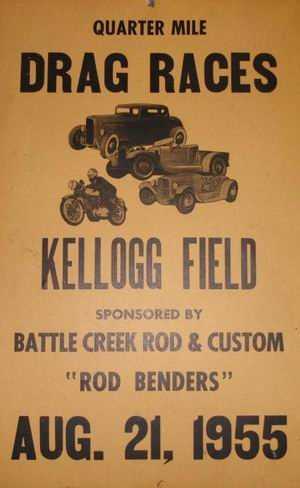 I hope this brings more stories about the history of Kellogg Field out of the woodwork, into public domain. There is history all around us, we just need to learn of it all. Rick, in response to your post about the General Tooler Super Stocker, the Jameson family ran that car back in the late 60's and early 70's. They have been family friends for the last 30 years or so. I do know that they have large number of photos of their cars on the wall in their their shop and some of them are of the General Tooler car. One of the sons has probably the nicest 1969 Dodge Charger that you will ever see!! Their shop is in Richland, MI on M-89. 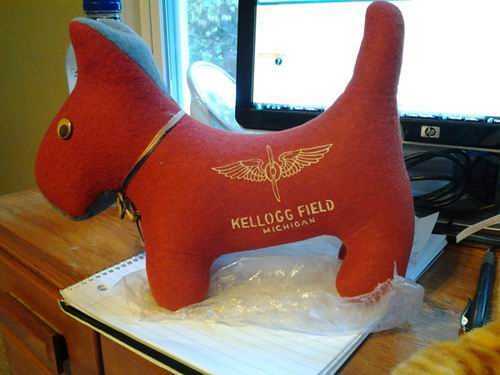 Kellogg feild was and still is a airport. In the fiftys 56,57 ?drags were held on the west side on a unused taxi way. To get to the strip you had to drive outside the Air Nat. GuardBase fence off Dickman rd. It was a one lane dirt road. I think races were held on sat. and maybe sun. Anyone could race if you passed checks and qualified in your class. Seems it only lasted a couple of years, then theymoved to Martin. I know that John Grivens the fromer owner of 131 had a lot to do with that old place. I would try too look up guy named: David Crane in the Battle Creek area. He is an old drag racer and has a small museum of drag racing and would be your best source of info on tacks in this area. General Tooler was a ''66 Charger,if IRC, raced by the Nichols* family who lived on the westside of Kalamazoo. Don''t know much more about them,I knew Jack slightly,I believe he had older brother(s) who crewed (drove?) the Tooler. U. S. 131 ''Martin'' Dragway probably would have been their home track. Hope this helps. * spelling?.